Metadata nodes can be uniqued, like constants, or distinct. Temporary metadata nodes (with full support for RAUW) can be used to delay uniquing until forward references are known. The basic metadata node is an MDTuple. There is limited support for RAUW at construction time. At construction time, if any operand is a temporary node (or an unresolved uniqued node, which indicates a transitive temporary operand), the node itself will be unresolved. As soon as all operands become resolved, it will drop RAUW support permanently. If an unresolved node is part of a cycle, resolveCycles() needs to be called on some member of the cycle once all temporary nodes have been replaced. Definition at line 863 of file Metadata.h. Definition at line 895 of file Metadata.h. Definition at line 1055 of file Metadata.h. Definition at line 1056 of file Metadata.h. Definition at line 503 of file Metadata.cpp. Definition at line 1077 of file Metadata.h. References A, B, llvm::Metadata::getMetadataID(), and intersect(). Definition at line 521 of file Metadata.cpp. Referenced by llvm::DIType::clone(), cloneOrBuildODR(), and wrapConstantAsMetadata(). Definition at line 895 of file Metadata.cpp. References B, getContext(), getOrSelfReference(), op_begin(), and op_end(). Referenced by AddAliasScopeMetadata(), llvm::LoopVersioning::annotateInstWithNoAlias(), CloneAliasScopeMetadata(), getMostGenericAliasScope(), and PropagateParallelLoopAccessMetadata(). Calls replaceAllUsesWith(nullptr) before deleting, so any remaining references will be reset. Definition at line 830 of file Metadata.cpp. References assert(), isTemporary(), and replaceAllUsesWith(). Referenced by LLVMDisposeTemporaryMDNode(), and llvm::TempMDNodeDeleter::operator()(). Definition at line 689 of file Metadata.cpp. References assert(), E, llvm::Metadata::getMetadataID(), getNumOperands(), getOperand(), llvm::ContextAndReplaceableUses::getReplaceableUses(), llvm::ContextAndReplaceableUses::hasReplaceableUses(), I, isResolved(), isUniqued(), llvm_unreachable, llvm::RISCVFenceField::O, op_begin(), llvm::Ref, llvm::ReplaceableMetadataImpl::replaceAllUsesWith(), resolve(), llvm::ReplaceableMetadataImpl::resolveAllUses(), setOperand(), storeDistinctInContext(), llvm::ContextAndReplaceableUses::takeReplaceableUses(), and llvm::Metadata::Uniqued. Definition at line 1165 of file Metadata.h. Referenced by AddAliasScopeMetadata(), llvm::Module::addModuleFlag(), AddRuntimeUnrollDisableMetaData(), llvm::LoopVersioning::annotateInstWithNoAlias(), llvm::annotateValueSite(), llvm::DIExpression::append(), buildMUBUFOffsetLoadStore(), canonicalizeMetadataForValue(), CloneAliasScopeMetadata(), llvm::DILocation::cloneWithDiscriminator(), llvm::GlobalObject::copyMetadata(), llvm::copyRangeMetadata(), createAccessTag(), llvm::MDBuilder::createAliasScope(), llvm::MDBuilder::createAliasScopeDomain(), llvm::MDBuilder::createAnonymousAARoot(), llvm::DIBuilder::createArrayType(), llvm::DIBuilder::createBasicType(), llvm::DIBuilder::createBitFieldMemberType(), llvm::MDBuilder::createBranchWeights(), llvm::MDBuilder::createCallbackEncoding(), llvm::MDBuilder::createCallees(), llvm::DIBuilder::createClassType(), llvm::DIBuilder::createCommonBlock(), llvm::DIBuilder::createConstantValueExpression(), llvm::DIBuilder::createEnumerationType(), llvm::DIBuilder::createEnumerator(), llvm::DIBuilder::createExpression(), llvm::createFalkorMarkStridedAccessesPass(), llvm::DIBuilder::createFile(), llvm::DIBuilder::createForwardDecl(), llvm::MDBuilder::createFPMath(), llvm::DIExpression::createFragmentExpression(), llvm::DIBuilder::createFriend(), llvm::MDBuilder::createFunctionEntryCount(), llvm::MDBuilder::createFunctionSectionPrefix(), llvm::DIBuilder::createGlobalVariableExpression(), createImportedModule(), llvm::DIBuilder::createInheritance(), llvm::MDBuilder::createIrrLoopHeaderWeight(), llvm::DIBuilder::createLexicalBlockFile(), llvm::DIBuilder::createMacro(), llvm::DIBuilder::createMemberPointerType(), llvm::DIBuilder::createMemberType(), llvm::DIBuilder::createModule(), llvm::DIBuilder::createNameSpace(), llvm::createObjCARCOptPass(), llvm::DIBuilder::createObjCIVar(), llvm::DIBuilder::createObjCProperty(), llvm::createPGOFuncNameMetadata(), llvm::DIBuilder::createPointerType(), llvm::DIBuilder::createQualifiedType(), llvm::MDBuilder::createRange(), llvm::DIBuilder::createReferenceType(), llvm::createSIAddIMGInitPass(), llvm::DIBuilder::createStaticMemberType(), createStringMetadata(), llvm::DIBuilder::createStructType(), llvm::DIBuilder::createSubroutineType(), llvm::MDBuilder::createTBAAAccessTag(), llvm::MDBuilder::createTBAANode(), llvm::MDBuilder::createTBAARoot(), llvm::MDBuilder::createTBAAScalarTypeNode(), llvm::MDBuilder::createTBAAStructNode(), llvm::MDBuilder::createTBAAStructTagNode(), llvm::MDBuilder::createTBAAStructTypeNode(), llvm::MDBuilder::createTBAATypeNode(), llvm::DIBuilder::createTemplateParameterPack(), llvm::DIBuilder::createTemplateTypeParameter(), createTemplateValueParameterHelper(), llvm::DIBuilder::createTypedef(), llvm::DIBuilder::createUnionType(), llvm::MDBuilder::createUnpredictable(), llvm::DIBuilder::createUnspecifiedType(), llvm::DIBuilder::createVariantMemberType(), llvm::DIBuilder::createVariantPart(), llvm::DIBuilder::createVectorType(), llvm::createX86PadShortFunctions(), DisableAllLoopOptsOnLoop(), llvm::SIFrameLowering::eliminateCallFramePseudoInstr(), llvm::SIRegisterInfo::eliminateFrameIndex(), llvm::SIFrameLowering::emitEntryFunctionPrologue(), llvm::SIFrameLowering::emitEpilogue(), llvm::AArch64FrameLowering::emitEpilogue(), llvm::ARCFrameLowering::emitEpilogue(), llvm::SIFrameLowering::emitPrologue(), llvm::SystemZFrameLowering::emitPrologue(), emitXBegin(), llvm::DIExpression::extractAddressClass(), extractMDNode(), llvm::DIBuilder::finalize(), llvm::DIBuilder::finalizeSubprogram(), findBasePointer(), foldCtpop(), foldCttzCtlz(), llvm::DebugLoc::get(), getHalfSizedType(), llvm::DILocation::getMergedLocation(), getMostGenericRange(), getMulHu(), getNewValueJumpOpcode(), llvm::DIBuilder::getOrCreateSubrange(), llvm::DIBuilder::getOrCreateTypeArray(), getOrSelfReference(), getSubprogram(), hasOnlyUniformBranches(), INITIALIZE_PASS(), InsertReturnAddressAuth(), instrumentMaskedLoadOrStore(), IsInterestingCmp(), isKnownTypeIdMember(), LLVMDIBuilderCreateDebugLocation(), LLVMMDNodeInContext(), llvm::makeFollowupLoopID(), llvm::SIRegisterInfo::materializeFrameBaseRegister(), llvm::MDBuilder::mergeCallbackEncodings(), llvm::LoopVersioning::prepareNoAliasMetadata(), llvm::DIExpression::prependOpcodes(), PushArgMD(), llvm::ARMTargetLowering::ReplaceNodeResults(), llvm::DIBuilder::replaceTemporary(), llvm::SIRegisterInfo::restoreSGPR(), rotateSign(), llvm::CGProfilePass::run(), llvm::WholeProgramDevirtPass::run(), selectJumpTableArmEncoding(), llvm::LoopVectorizeHints::setAlreadyVectorized(), llvm::Loop::setLoopAlreadyUnrolled(), setNoClobberMetadata(), setUniformMetadata(), llvm::SIRegisterInfo::spillSGPR(), splitGlobal(), StackMallocSizeClass(), llvm::StripDebugInfo(), stripDebugLocFromLoopID(), llvm::Instruction::swapProfMetadata(), llvm::DISubprogram::toSPFlags(), transferSRADebugInfo(), TryToShrinkGlobalToBoolean(), llvm::uniteAccessGroups(), llvm::Instruction::updateProfWeight(), llvm::UpgradeModuleFlags(), llvm::UpgradeTBAANode(), verifyAddrSpace(), and llvm::InstCombiner::visitCallInst(). Definition at line 923 of file Metadata.h. Referenced by llvm::GlobalObject::addMetadata(), llvm::GlobalObject::addTypeMetadata(), llvm::DIExpression::append(), llvm::GlobalObject::clearMetadata(), concatenate(), llvm::GlobalObject::copyMetadata(), createAccessTag(), llvm::DIExpression::createFragmentExpression(), llvm::Instruction::dropUnknownNonDebugMetadata(), llvm::GlobalObject::eraseMetadata(), llvm::DIExpression::extractAddressClass(), llvm::Instruction::extractProfTotalWeight(), fixupLineNumbers(), llvm::DebugLoc::get(), llvm::GlobalObject::getAllMetadata(), getIRBForDbgInsertion(), llvm::DILocation::getMergedLocation(), llvm::GlobalObject::getMetadata(), getMostGenericRange(), intersect(), llvm::makeFollowupLoopID(), llvm::DIExpression::prependOpcodes(), llvm::Instruction::setAAMetadata(), llvm::GlobalObject::setMetadata(), storeDistinctInContext(), llvm::StripDebugInfo(), stripDebugLocFromLoopID(), llvm::Instruction::swapProfMetadata(), llvm::uniteAccessGroups(), and llvm::UpgradeTBAANode(). Definition at line 1173 of file Metadata.h. Referenced by llvm::DebugLoc::appendInlinedAt(), llvm::DICompositeType::buildODRType(), llvm::DIBuilder::createCompileUnit(), llvm::DIBuilder::createGlobalVariableExpression(), llvm::DIBuilder::createLexicalBlock(), fixupLineNumbers(), FunctionNumber(), getSubprogram(), llvm::makePostTransformationMetadata(), and llvm::StripDebugInfo(). Definition at line 1169 of file Metadata.h. Definition at line 922 of file Metadata.cpp. Referenced by llvm::combineMetadata(), llvm::Instruction::getAAMetadata(), and llvm::propagateMetadata(). Definition at line 1049 of file Metadata.cpp. References B, getOperand(), and llvm::ConstantInt::getZExtValue(). Definition at line 929 of file Metadata.cpp. References B, llvm::APFloatBase::cmpLessThan, llvm::APFloat::compare(), and getOperand(). Referenced by llvm::combineMetadata(), and llvm::propagateMetadata(). Definition at line 977 of file Metadata.cpp. References addRange(), llvm::ConstantAsMetadata::get(), get(), getContext(), getNumOperands(), getOperand(), llvm::ConstantInt::getValue(), I, llvm::ConstantRange::isFullSet(), llvm::SmallVectorTemplateBase< T >::push_back(), llvm::SmallVectorImpl< T >::reserve(), llvm::SmallVectorImpl< T >::resize(), Size, llvm::SmallVectorBase::size(), llvm::APInt::slt(), and tryMergeRange(). Definition at line 475 of file TypeBasedAliasAnalysis.cpp. Definition at line 1074 of file Metadata.h. Referenced by llvm::AbstractCallSite::AbstractCallSite(), AddRuntimeUnrollDisableMetaData(), llvm::addStringMetadataToLoop(), addToAccessGroupList(), llvm::cacheAnnotationFromMD(), checkMDProf(), CloneAliasScopeMetadata(), llvm::FunctionComparator::cmpMem(), llvm::MDNodeOpsKey::compareOps(), llvm::computeKnownBitsFromRangeMetadata(), llvm::ConstantFoldTerminator(), createAccessTag(), llvm::MDBuilder::createMutableTBAAAccessTag(), dropAllReferences(), llvm::MachineInstr::emitError(), EmitGCCInlineAsmStr(), llvm::AMDGPU::HSAMD::MetadataStreamerV2::emitKernel(), llvm::AsmPrinter::EmitSpecialLLVMGlobal(), llvm::MDTupleTypedArrayWrapper< T >::empty(), llvm::findOptionMDForLoopID(), llvm::findStringMetadataForLoop(), GetBranchWeights(), llvm::getConstantRangeFromMetadata(), llvm::DOTGraphTraits< const Function * >::getEdgeAttributes(), llvm::ProfileSummary::getFromMD(), llvm::Loop::getLoopID(), getMostGenericRange(), llvm::NamedMDNode::getOperand(), getOptimizationFlags(), getOptionalBoolLoopAttribute(), getParentPad(), getSummaryFromMD(), llvm::GetUnrollMetadata(), getVal(), llvm::getValueProfDataFromInst(), llvm::intersectAccessGroups(), isContiguous(), isFuncOrArgAttr(), isKeyValuePair(), isKnownTypeIdMember(), isNewFormatTBAATypeNode(), IsRootTBAANode(), IsScalarTBAANodeImpl(), isStructPathTBAA(), llvm::LTOModule::makeBuffer(), llvm::makeFollowupLoopID(), llvm::makePostTransformationMetadata(), llvm::MDBuilder::mergeCallbackEncodings(), llvm::LocationMetadata::parse(), llvm::DebugInfoFinder::processValue(), rangeMetadataExcludesValue(), llvm::MachinePipeliner::runOnMachineFunction(), setBranchWeights(), llvm::Loop::setLoopID(), llvm::NamedMDNode::setOperand(), llvm::DITypeRefArray::size(), llvm::MDTupleTypedArrayWrapper< T >::size(), srcMgrDiagHandler(), llvm::StripDebugInfo(), llvm::Instruction::swapProfMetadata(), UnrollAndJamCountPragmaValue(), UnrollCountPragmaValue(), llvm::UpgradeModuleFlags(), llvm::UpgradeTBAANode(), llvm::LoopVectorizeHints::vectorizeAnalysisPassName(), llvm::TBAAVerifier::visitTBAAMetadata(), wrapConstantAsMetadata(), and WriteConstantInternal(). Definition at line 1068 of file Metadata.h. Referenced by llvm::AbstractCallSite::AbstractCallSite(), AccessQualFromMD(), AddRuntimeUnrollDisableMetaData(), ArgTypeFromMD(), llvm::cacheAnnotationFromMD(), checkMDProf(), CloneAliasScopeMetadata(), llvm::FunctionComparator::cmpMem(), llvm::computeKnownBitsFromRangeMetadata(), llvm::ConstantFoldTerminator(), llvm::MDBuilder::createMutableTBAAAccessTag(), dropAllReferences(), llvm::MachineInstr::emitError(), EmitGCCInlineAsmStr(), llvm::AMDGPU::HSAMD::MetadataStreamerV2::emitKernel(), llvm::TargetLoweringObjectFileELF::emitModuleMetadata(), llvm::AsmPrinter::EmitSpecialLLVMGlobal(), llvm::findOptionMDForLoopID(), llvm::findStringMetadataForLoop(), getARClassRegisterMask(), getAssociatedSymbol(), GetBranchWeights(), llvm::getConstantRangeFromMetadata(), llvm::DOTGraphTraits< const Function * >::getEdgeAttributes(), llvm::Function::getEntryCount(), llvm::FPMathOperator::getFPAccuracy(), llvm::ProfileSummary::getFromMD(), getIntOperandFromRegisterString(), llvm::Loop::getLoopID(), getMDNodeOperandImpl(), getMostGenericAlignmentOrDereferenceable(), getMostGenericFPMath(), getMostGenericRange(), getOptimizationFlags(), getOptionalBoolLoopAttribute(), getParentPad(), getSummaryFromMD(), llvm::GetUnrollMetadata(), getVal(), llvm::getValueProfDataFromInst(), HasAnyUnrollPragma(), HasBranchWeights(), INITIALIZE_PASS(), isContiguous(), isFuncOrArgAttr(), isKeyValuePair(), isKnownTypeIdMember(), llvm::SelectionDAGISel::IsLegalToFold(), isNewFormatTBAATypeNode(), IsScalarTBAANodeImpl(), isStructPathTBAA(), llvm::LTOModule::makeBuffer(), llvm::makeFollowupLoopID(), llvm::makePostTransformationMetadata(), llvm::MDBuilder::mergeCallbackEncodings(), llvm::DITypeRefArray::operator(), llvm::MDTupleTypedArrayWrapper< T >::operator(), llvm::LocationMetadata::parse(), rangeMetadataExcludesValue(), replaceOperandWith(), llvm::MachinePipeliner::runOnMachineFunction(), selectJumpTableArmEncoding(), setBranchWeights(), llvm::Loop::setLoopID(), srcMgrDiagHandler(), llvm::Instruction::swapProfMetadata(), UnrollAndJamCountPragmaValue(), UnrollCountPragmaValue(), llvm::UpgradeModuleFlags(), llvm::UpgradeRetainReleaseMarker(), llvm::UpgradeTBAANode(), llvm::LoopVectorizeHints::vectorizeAnalysisPassName(), llvm::TBAAVerifier::visitTBAAMetadata(), and wrapConstantAsMetadata(). Definition at line 1177 of file Metadata.h. Referenced by llvm::MDBuilder::createAnonymousAARoot(), llvm::DIBuilder::createReplaceableCompositeType(), llvm::DIBuilder::createTempFunctionFwdDecl(), llvm::DIBuilder::createTempGlobalVariableFwdDecl(), llvm::DIBuilder::createTempMacroFile(), llvm::makePostTransformationMetadata(), and stripDebugLocFromLoopID(). Definition at line 909 of file Metadata.cpp. References getContext(), getOrSelfReference(), llvm::is_contained(), op_begin(), and op_end(). Definition at line 942 of file Metadata.h. Referenced by cloneOrBuildODR(), getOptimizationFlags(), hasConflictingReferenceFlags(), isOperandUnresolved(), llvm::ValueEnumerator::print(), rotateSign(), and llvm::StripDebugInfo(). If isTemporary(), this always returns false; if isDistinct(), this always returns true. If isUniqued(), returns true if this has already dropped RAUW support (because all operands are resolved). As forward declarations are resolved, their containers should get resolved automatically. However, if this (or one of its operands) is involved in a cycle, resolveCycles() needs to be called explicitly. Definition at line 939 of file Metadata.h. Referenced by llvm::DIBuilder::DIBuilder(), dropAllReferences(), llvm::DIBuilder::finalize(), forEachUser(), isOperandUnresolved(), llvm::LexicalScope::LexicalScope(), llvm::DIBuilder::replaceArrays(), llvm::DIBuilder::replaceVTableHolder(), resolve(), resolveCycles(), storeDistinctInContext(), and wrapConstantAsMetadata(). Definition at line 452 of file TypeBasedAliasAnalysis.cpp. References B, isStructPathTBAA(), matchAccessTags(), and llvm::Tag. Definition at line 943 of file Metadata.h. Referenced by deleteTemporary(), llvm::DIBuilder::finalizeSubprogram(), forEachUser(), isOperandUnresolved(), and resolve(). Definition at line 941 of file Metadata.h. Referenced by dropAllReferences(), isOperandUnresolved(), MDNode(), replaceOperandWith(), resolve(), setOperand(), and wrapConstantAsMetadata(). Definition at line 892 of file Metadata.h. Referenced by replaceOperandWith(), and setOperand(). Definition at line 893 of file Metadata.h. Definition at line 897 of file Metadata.h. Definition at line 1058 of file Metadata.h. Referenced by llvm::DITypeRefArray::begin(), llvm::MDTupleTypedArrayWrapper< T >::begin(), llvm::MDNodeOpsKey::calculateHash(), llvm::MDNodeOpsKey::compareOps(), concatenate(), dropAllReferences(), intersect(), llvm::ValueEnumerator::print(), stripDebugLocFromLoopID(), and wrapConstantAsMetadata(). Definition at line 1062 of file Metadata.h. Referenced by llvm::MDNodeOpsKey::calculateHash(), concatenate(), llvm::DITypeRefArray::end(), llvm::MDTupleTypedArrayWrapper< T >::end(), intersect(), llvm::ValueEnumerator::print(), and stripDebugLocFromLoopID(). Definition at line 1066 of file Metadata.h. Referenced by llvm::AbstractCallSite::AbstractCallSite(), addToAccessGroupList(), llvm::TypeFinder::clear(), collectMDInDomain(), llvm::AMDGPU::HSAMD::MetadataStreamerV2::emitKernel(), llvm::TargetLoweringObjectFileELF::emitModuleMetadata(), forEachUser(), getOptimizationFlags(), getSummaryFromMD(), hasConflictingReferenceFlags(), hasSelfReference(), llvm::Loop::isAnnotatedParallel(), isOperandUnresolved(), llvm::makeFollowupLoopID(), llvm::ValueEnumerator::print(), llvm::DIBuilder::replaceVTableHolder(), resolveCycles(), rotateSign(), llvm::StripDebugInfo(), stripDebugLocFromLoopID(), and wrapConstantAsMetadata(). Definition at line 492 of file Metadata.cpp. References llvm::alignTo(), E, N, and llvm::RISCVFenceField::O. Required by std, but never called. Definition at line 881 of file Metadata.h. Definition at line 886 of file Metadata.h. Definition at line 480 of file Metadata.cpp. References llvm::alignTo(), E, llvm::RISCVFenceField::O, and Size. Definition at line 948 of file Metadata.h. Referenced by deleteTemporary(), hasSelfReference(), and llvm::DIBuilder::replaceTemporary(). Definition at line 858 of file Metadata.cpp. References getOperand(), isUniqued(), mutable_begin(), and setOperand(). Referenced by AddRuntimeUnrollDisableMetaData(), llvm::MDBuilder::createAnonymousAARoot(), DisableAllLoopOptsOnLoop(), llvm::makeFollowupLoopID(), llvm::makePostTransformationMetadata(), stripDebugLocFromLoopID(), and wrapConstantAsMetadata(). Create a distinct version of N – in place, if possible – and return it. Takes ownership of the temporary node. Definition at line 993 of file Metadata.h. References llvm::Metadata::handleChangedOperand(), llvm::Ref, llvm::Metadata::Storage, and llvm::SPII::Store. Referenced by cloneOrBuildODR(), and llvm::DIBuilder::createArtificialSubprogram(). Replace a temporary node with a permanent one. Try to create a uniqued version of N – in place, if possible – and return it. If N cannot be uniqued, return a distinct node instead. Definition at line 971 of file Metadata.h. 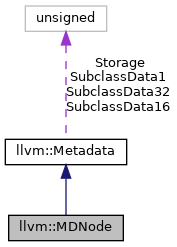 Create a uniqued version of N – in place, if possible – and return it. Takes ownership of the temporary node. Definition at line 983 of file Metadata.h. Referenced by createTypeWithFlags(), llvm::DIBuilder::replaceTemporary(), and wrapConstantAsMetadata(). Definition at line 575 of file Metadata.cpp. References assert(), llvm::ContextAndReplaceableUses::hasReplaceableUses(), isOperandUnresolved(), isResolved(), isTemporary(), isUniqued(), and llvm::ContextAndReplaceableUses::takeReplaceableUses(). Referenced by llvm::BTFDebug::BTFDebug(), llvm::BTFTypeDerived::completeType(), dropAllReferences(), llvm::DebugHandlerBase::getBaseTypeSize(), llvm::DbgVariable::getType(), resolveCycles(), shouldAlwaysEmitCompleteClassType(), and shouldEmitUdt(). Once all forward declarations have been resolved, force cycles to be resolved. No operands (or operands' operands, etc.) have isTemporary(). Definition at line 620 of file Metadata.cpp. References assert(), isResolved(), N, operands(), and resolve(). Referenced by llvm::DIBuilder::finalize(), and wrapConstantAsMetadata(). Sets the operand directly, without worrying about uniquing. Definition at line 870 of file Metadata.cpp. References assert(), I, isUniqued(), mutable_begin(), and llvm::MDOperand::reset(). Referenced by dropAllReferences(), MDNode(), replaceOperandWith(), and llvm::salvageDebugInfoForDbgValues(). Definition at line 836 of file Metadata.cpp. References assert(), llvm::Metadata::Distinct, llvm::LLVMContextImpl::DistinctMDNodes, getContext(), llvm::Metadata::getMetadataID(), isResolved(), llvm_unreachable, llvm::LLVMContext::pImpl, and llvm::Metadata::Storage. Referenced by dropAllReferences(), and isOperandUnresolved(). Definition at line 42 of file MetadataImpl.h. References llvm::Metadata::Distinct, N, llvm::Metadata::Temporary, and llvm::Metadata::Uniqued. Referenced by adjustColumn(), llvm::DIFile::getChecksumKind(), and isCanonical(). Definition at line 28 of file MetadataImpl.h. References llvm::Metadata::Distinct, llvm_unreachable, N, llvm::Metadata::Temporary, and llvm::Metadata::Uniqued. Definition at line 865 of file Metadata.h. Definition at line 864 of file Metadata.h.